Affiliate marketing has been around for a long time. Even before the Internet, some businesses would pay a referral or finder’s fees to people who sent new customers. But the Internet has expanded the concept through affiliate marketing and has made it possible for anyone to make money online. 1. Verify their idea is profitable. They do this by researching the keywords related to their topic using a keyword tool such as SEO Book or Wordtracker to find out how many people search the words each month. They also check out the number of websites that are ranked for the keyword and what the sites do to make money. 2. Choose a niche topic of interest to people who need to buy something to fix their problem. A niche is a narrowly defined group within a larger group. Despite being a smaller group, niches tend to make more money than general topics. Niches work well because they’re focused on a targeted topic or group. For example, if I where to start WAHS today, I might narrow the focus to just work-at-home jobs (target only those who want to telecommute – topic) or maybe focus the content towards baby boomers (group). Not only should you choose a focused topic or group, but also, it should be related to a problem that an affiliate product can solve. For example, teenagers with acne is a niche topic targeting a group highly motivated to spend money to fix the problem. Teens and their parents will spend money to fix acne. Affiliate marketing earns money through sales. People buy to solve a problem. Therefore, it’s crucial that you choose a niche people are looking for help in and select affiliate products that will be the solution they need. 3. Focus on building a list. There are many ways to promote affiliate programs including squeeze pages and blogs, but the super affiliate views these methods as ways to develop an email list. The super affiliate asks visitors to his squeeze page or blog to join his email list in exchange for something free such as a report. Having a list allows the super affiliate to continue to promote his affiliate product if the person doesn’t buy during the first visits to the site, and also allows him to promote other related products. In fact, super affiliates make most their money not from their squeeze pages or blogs, but from their lists. There are several great resources to building a list. I’ve used Aweber forever and love it. MailChimp is free, but only for 2,000 subscribers. Once you hit that threshold, the price goes up even higher than Aweber. Convertkit is another popular email service. 4. Market, market and market some more. Affiliate marketing, like any other business venture, requires marketing. People can’t buy affiliate products or services from you if they don’t know about you. Super affiliates use a variety marketing techniques to get people their websites including search engine optimization (SEO), article marketing, videos, pay-per-click ads (i.e. AdWords or Facebook Ads), and joint ventures with other affiliate marketers that have a list. Many people looking to work at home evaluate a program by how much can be made. Affiliate marketing like many other work-at-home options can make a great deal of money; however, like other work-at-home options, most people don’t make anything at all. That’s not the fault of affiliate marketing. Success in affiliate marketing depends on you. It requires that you do the research and implement proven strategies. You have to work on it every day and tweak your actions if things aren’t working as planned. You need to give it time and commitment. 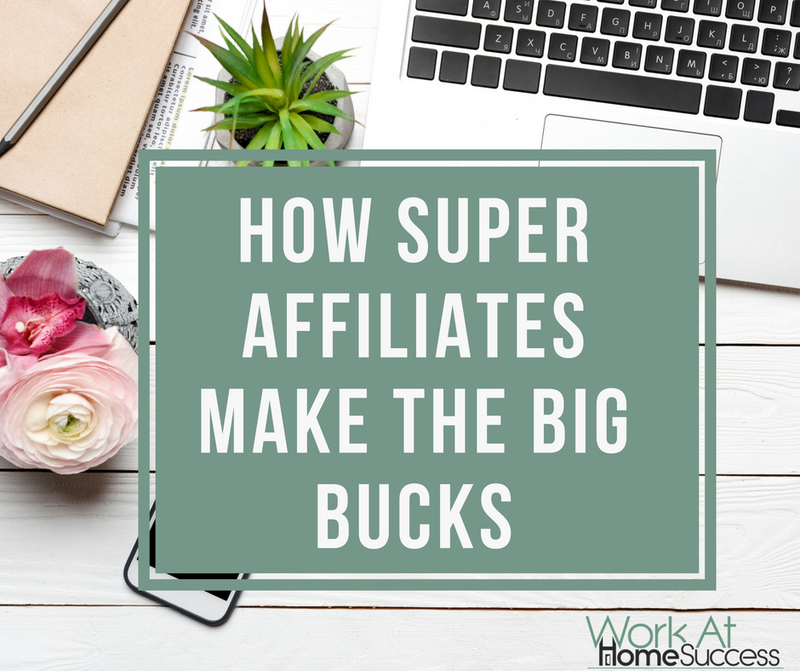 Super affiliates are super not because they’re smarter or understand technology better, they’re super because they kept learning about marketing, tweaking their actions and working on their business until they made money. Affiliate Marketing 101: This post offers an an overview of what affiliate marketing is and how to make money at it. Affiliate Funnel Success: This is a free email resource that teaches you how to make money in affiliate marketing without having to start a blog. You’ll get a free Affiliate Funnel Planner, then a series of emails that give you tips, insights, and resources to become a super affiliate. Free Affiliate Bootcamp: This is an extensive free affiliate marketing training that is focused on funnel marketing (as opposed to using blogs) to build an affiliate business. I’ve taken the course and used many of the tips and ideas it suggests. Making Sense of Affiliate Marketing: If you have a blog, or want to blog, this is the most affordable and thorough affiliate course I’ve found so far. This course offers a really good overview of everything involved, including how to choose and sign up for affiliate programs, and more importantly, different ways to get your affiliate link in front of people. Do you have a super affiliate tip to share? Let us know in the comments below! Affiliate advertising is a great way to do business. Many businesses have chosen to do this in the past and if they worked it effectivily it served them well. This is a good post gives a good knowledge base for Affiliate Marketing.